12 Jul 2017 Washington, D.C. The Yellowhammer state’s political summer is getting hotter as Luther Strange, an establishment-backed candidate for the U.S. Senate, is falsely smearing his opponent Rep. Mo Brooks (R-AL) as anti-Trump. Interestingly, “Never Trump” operatives have descended on the race around Strange bashing Brooks—acting like they supported Trump all the time when they did not—and Strange is refusing to provide any evidence he actually supported Trump. Meanwhile, Brooks is emerging as the strongest defender of Trump and his agenda—and even Trump campaign operatives from Alabama have confirmed that on record to Breitbart News. Brooks himself is firing back at Strange and his anti-Trump allies, while supporters of the president rush in to Brooks’ side. Another lie from Big Lyin’ Luther. Luther Strange, and the DC Swamp, are desperate because Alabama voters do not like and do not trust Luther Strange. Voters know Strange acted unethically when he sought Governor Bentley’s appointment to the Senate while holding the threat of criminal prosecution over Bentley’s head. That’s why they are running this ad, that’s why Big Lyin’ Luther’s DC handlers are hiding him, that’s why he is avoiding debates and only doing carefully controlled media appearances. Breitbart News has reached out to Strange’s office to ask him if he ever endorsed Trump—no public record of him endorsing Trump before the general election in November 2016 has been uncovered. Strange’s office has refused to provide to Breitbart News any evidence he supported the president before he won. An early Trump supporter in Alabama—the campaign’s 2016 state co-chairman, who is now backing Brooks—tells Breitbart News exclusively as well that Strange never supported the president all the way through the general election and did not appear at any Trump events or help the campaign whatsoever until after Trump had defeated Democrat Hillary Rodham Clinton. I ended up bringing in another guy as co-chair, but I was the first person with the [Trump] campaign in the state of Alabama and ended up being the co-chair for the state. It disgusts me that someone like Luther Strange who never picked any side, who laid back and waited for all the dust to clear then comes out and tries to pretend like he supported Donald Trump. It’s just completely disingenuous and it’s exactly the kind of people we don’t need in Washington, D.C. I want somebody who’s willing to speak their mind, state their opinion, stand behind it and move forward from that point and that’s who Mo is. Mo Brooks has very strong character. Brooks, while critical of Trump in the primaries, actually donated to the Trump campaign, while it is unclear if Strange ever did. Strange spokeswoman Shana Teehan refused to provide any proof of Strange support for Trump during 2015 or 2016 whatsoever, and refused to answer if Strange donated to the Trump campaign during the general election as Brooks did. 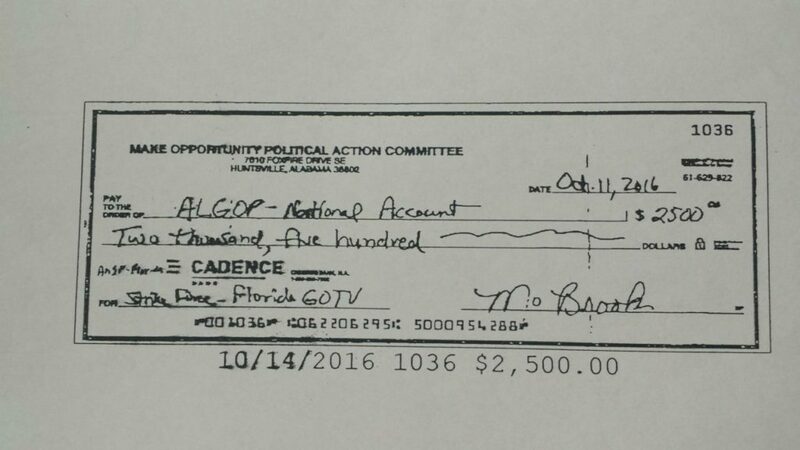 Brooks’ donation, per a check image obtained by Breitbart News, actually came after many other anti-Trump Republicans including Strange ally, anti-Trump House Speaker Paul Ryan abandoned the now-president of the United States after the leaked Access Hollywood tape appeared. Strange, who does not appear to have ever endorsed Trump, has refused to answer through his spokeswoman whether he continues to support Ryan remaining as Speaker of the House. Ryan told his Republican colleagues he is “not going to defend Donald Trump—not now, not in the future.” Ryan made the pledge to abandon Trump in an Oct. 10, 2016, conference call with House Republicans in which he essentially pushed his colleagues away from the now-president. I’ll tell you, the first time Luther Strange showed up at anything was after Trump won the general election he did a victory tour—we convinced him to come back through Alabama, through Mobile where we started, and say ‘Thank You.’ Luther Strange strong-arms his way through the bureaucracy of being able to speak at that event and he shows up there. That was the first time Luther Strange ever showed his face, ever showed up or spoke up about being a Trump fan. He is a liar. He is an absolute, pathological liar and hopefully the people of Alabama will be able to see through the smokescreen that Mitch McConnell and the political elitists are trying to put forward. I think that’s what galls me more than anything. Interestingly, while Ryan and Strange and other Washington establishment Republicans were running away from Trump, Brooks was running toward the fire. The day after Ryan said he was not going to ever defend Donald Trump again, Brooks cut a $2,500 check to the effort to get Trump elected. In other words, Brooks backed a critical operation that helped deliver the flip of the battleground state of Florida in the Nov. 8, 2016, general election from a Democrat win by Barack Obama over Mitt Romney in 2012 to a GOP win by Donald Trump over Hillary Clinton in 2016. We didn’t have the money—we did not have the money to send a strike force to Florida out of Alabama. We were doing things and constantly helping but we were trying to raise money at the grassroots level because we didn’t want every political action committee out there throwing money at the campaign that would—we wanted to do it as local as possible and Mo was a big part of that. He was a vital part of that. 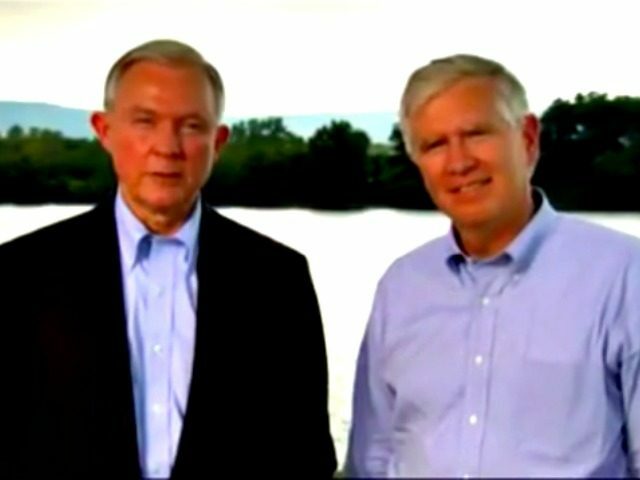 Brooks won in the conservative wave in 2010, thanks in large part to that Sessions ad, and has remained a steadfast ally of Sessions and conservatives in the U.S. House since then. Strange, on the other hand, was appointed under questionable circumstances by former Gov. Robert Bentley to the Senate seat vacated by Sessions. The attack ads come as Brooks has gained popularity throughout Alabama ahead of an Aug. 15 primary election between Strange, Brooks, and Judge Roy Moore—the ex-chief justice of the Alabama Supreme Court—with Brooks’s promises to back President Trump’s border wall by any means necessary. It is expected, sources with familiarity of the race and internal polling of the various campaigns, that Moore will face either Strange or Brooks in the runoff in September, and whoever goes to the runoff against Moore will beat him. Shana Teehan, Strange’s spokeswoman who used to work for Rep. Will Hurd (R-TX), has refused to say whether Strange will support President Trump’s border wall. Hurd, Teehan’s old boss before she enlisted on Strange’s team, has publicly criticized the wall that Trump and Brooks want to build on the U.S. border with Mexico. Teehan has also refused to say whether Strange will publicly criticize Hurd and other Republicans who stand in the way of Trump’s border wall—but Brooks, in a campaign ad first reported in an earlier Breitbart News exclusive, said he would. The newest ad out on Wednesday morning includes images of “resistance” Democrat leaders like House Minority Leader Nancy Pelosi and Sen. Liz Warren (D-MA) in an attempt to conflate Brooks with them. It also includes a quote from Brooks during the 2016 GOP presidential primaries when he was backing Sen. Ted Cruz (R-TX) when he criticized now-President Donald Trump. “I don’t think you can trust Donald Trump with anything that he says,” Brooks said during the primary as captured by the ad. Steven Law, the president and CEO of Senate Leadership Fund and an acolyte of anti-Trump former Bush White House adviser Karl Rove, has attempted to further the false framing of Brooks as anti-Trump. According to The Hill newspaper, the anti-Trump forces like Law in the Senate Leadership Fund are pumping millions into this ad buy. “The Republican primary for U.S. Senate in Alabama will be the first test to see whether someone as stridently anti-Trump as Mo Brooks can survive in a state that is so overwhelmingly supportive of the President,” Law said in a statement accompanying the press release rolling out the phony attack ad. Law’s anti-Trump organization, Senate Leadership Fund, has blasted out press releases all day Wednesday containing attacks on Brooks—all in the name of supposedly supporting Trump. One press release contained previous criticisms Brooks made of Trump’s border wall, back when he was still supporting Ted Cruz before the general election. Another claimed that Brooks never actually endorsed or supported Trump during the general election—and points to an Oct. 11 interview Brooks gave to a local radio host as proof. Ironically, that is literally the day that Brooks cut his check to fund get-out-the-vote efforts for Trump in Florida. The notion that Senate Leadership Fund’s Steven Law is supportive of President Trump is silly and factually incorrect. Law is still listed as the president and chief executive officer of another group, American Crossroads, which is intricately linked with Rove. Rove founded American Crossroads in 2010 and Law is one of Rove’s closest allies. “He shouldn’t be allowed to write for the Wall Street Journal,” now President Trump, then a candidate, told Breitbart News about Rove. Steven Law, given multiple chances over the course of his political career, has continually refused to criticize or distance himself or his various organizations from the dark anti-Trump cloud that Rove hangs over them. Now, these efforts by Rove allies like Law seem to be backfiring in Alabama as they falsely claim the mantle of what President Trump would support. While the White House and the president have not officially weighed in on the race in Alabama, multiple White House sources tell Breitbart News that Brooks is clearly the best candidate for President Trump’s agenda. And Trump allies on the outside are rushing to defend Brooks from these dishonest attacks. Sam Nunberg, an original adviser to Trump who worked for the president for years, including in the early months of his presidential campaign, told Breitbart News that Mo Brooks is the best candidate in this race. Trump allies like Sean Hannity of Fox News and nationally syndicated radio hosts Laura Ingraham and Mark Levin have publicly backed Brooks over Strange as well, officially endorsing him. More endorsements, sources close to the campaign tell Breitbart News, are on the way. And that’s all in addition to Trump’s first campaign staffer in Alabama, Henry—who became his state campaign co-chairman—backing Brooks for Senate.